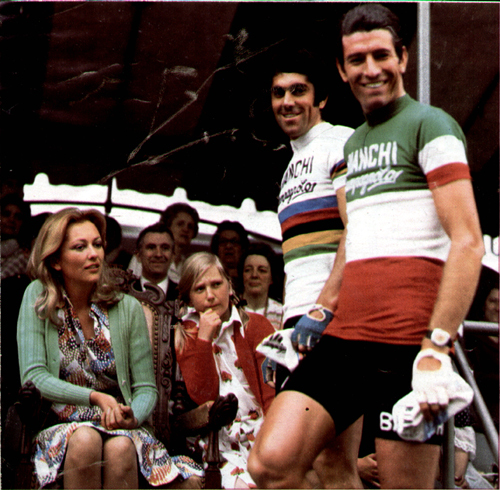 With his 1973 Giro championship, Merckx now had four Giro wins. In winning the 1973 edition he did what no man had done since Alfredo Binda in 1927, taking the lead on the first stage and keeping it until the end. Moreover, along the way to winning his “sunrise to sunset” Giro he won six stages. It was a scintillating performance. He also won the Points Classification and was second in the King of the Mountains to José-Manuel Fuentes. Today, upcoming Giro routes are usually announced in November or December. Back in 1973 things were not settled that early, with the route being announced in early March. 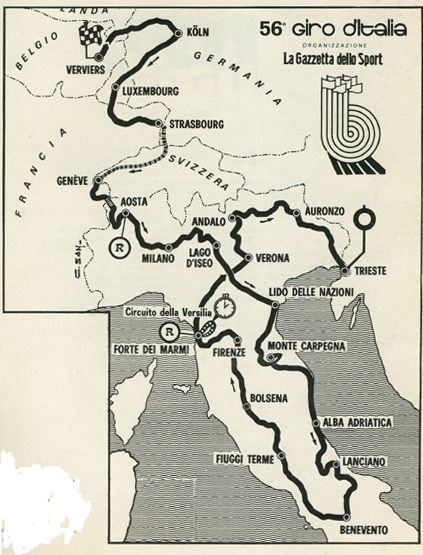 The route Torriani designed was different from previous Giri, placing the start in Verviers, Belgium, and having the riders spend a week working their way south in a Giro of the Common Market, through Holland, Germany, Luxembourg, France and then Switzerland before landing in Piedmont, Italy. The Tour de France had, like the Giro, previously crossed into adjoining countries, but neither had scheduled such a far-ranging foreign adventure. The next year the Tour would have a single stage in Plymouth, England (a colossal failure) but would not venture wildly afield again until 1980 when it traveled deep into Germany. A blue-ribbon peloton arrived in Verviers. Merckx, coming from a win over Luis Ocaña in the Vuelta that had ended only five days earlier, was there with his team of champions to try for a fourth Giro win. Hoping to at last get the better of the relentless Belgian was the formidable Spanish KAS team, with Fuente, Galdós, Gonzalo Aja, José Pesarrodona, Domingo Perurena and Santiago Lazcano. Filling out the roster of contenders were Gimondi, Panizza, Motta (now on the Zonca squad and no longer teamed with Gimondi, who had moved to Bianchi), de Vlaeminck, Pettersson, Francesco Moser, Bitossi, Zilioli, Olympic Champion Hennie Kuiper and a new face, Giovanni Battaglin, winner of the 1972 Tour de l’Avenir. Torriani was never afraid to do things differently. Case in point, the 5.2-kilometer prologue was a two-man team time trial. In the 1972 Giro Merckx and his teammate Roger Swerts had shown that they were the best against the clock. As a team, they were, as expected, the winners. What wasn’t expected were Fuente and his teammate Pesarrodona being only seven seconds slower. The prologue times didn’t count towards the General Classification, but the win gave Merckx the first Pink and Swerts the first Purple Jerseys. The next day the race finished in Cologne, Germany. 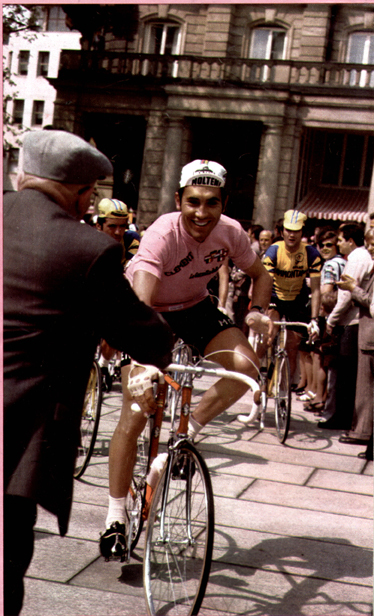 Merckx, being Merckx, had no intention of giving up the maglia rosa. With twenty kilometers to go he put his men at the front of the pack and had them ride nearly all-out. From that platform he launched his own solo attack, but he couldn’t stay away and the peloton was together in the final kilometer. And despite all of that work, he still led out the sprint, and incredibly, won it by a clear margin. The stage into Luxembourg was ridden Giro-style, piano until the last 60 kilometers. But those final attacks were ferocious, with de Vlaeminck, Bitossi, Merckx and Panizza managing to get about a half-minute clear and finishing in that order. The fourth stage went through the Mont Blanc tunnel and brought the Giro into Italy at last. Over the Colle San Carlo, Fuente tried his best to escape, but with a long descent after the summit (for which Merckx changed bikes to have a machine with huge gears for the downhill), he couldn’t hope to stay away. There was a regrouping that allowed Merckx a third stage win. So far Merckx’s team had been tyrannically controlling the race, making sure that every break had a brown-clad Molteni rider in it. Stage six, going from Milan eastward to Iseo, went over the Colle San Fermo. Both Merckx and Fuente sent their lieutenants up ahead to prepare for the coming attacks. Not waiting for Fuente to jump, Merckx attacked hard and only Panizza and Battaglin could answer the call. At the worst possible time, Fuente was crippled with cramps and had to get off his bike. The Merckx trio had to dig deep, being pursued by a formidable group: Bitossi, Motta, Gimondi and former World Hour Record holder Ole Ritter. Try as they might, the group couldn’t hold off the chasers, allowing Gianni Motta to take the stage. The unfortunate Fuente lost twelve minutes. After a boring trip across the pancake-flat Emilian Plain, the race went into the hilly countryside of Le Marche. On one of the early climbs of the day, Merckx escaped bringing Fuente along for company. Foolishly, Fuente took his pulls with the powerful Belgian and after having burned his matches, was spit out the back. Next Battaglin bridged up to Merckx and as the two sped over the hills they distanced themselves from the peloton. Merckx tried to drop Battaglin, but wasn’t able to lose his young Italian companion until the top of the last climb. Merckx bombed down the hill and raced into Carpegna 45 seconds ahead of Battaglin and more than four minutes ahead of the first chaser, Zilioli. At the stage’s end Fuente was in such a bad state, he thought he needed a doctor. He was fine and the next morning was fit to start the next stage. Roger de Vlaeminck’s hopes for a high placing were ruined as well after he lost nine minutes. They weren’t the only ones losing big. Trying to cut down on the spectators’ pushing riders up the hills, large fines were imposed on the riders who accepted the fans’ help. The next day the threat of a riders’ strike over the severity of the punishments came to nothing. Stage ten took the race further down the Adriatic coast into Abruzzo where, at last, Fuente seemed to be finding his legs. He escaped, only to be caught by Merckx, who won the stage, his fifth stage victory so far. Putting on an extraordinary—I guess the better adjective would be Merckxian—show of aggression and power, he now held the lead in the General Classification as well as the points and mountains categories. A crash early in stage eleven allowed Merckx to form a break that included de Vlaeminck, Gimondi and Motta. Battaglin was at the back of the field when he was hit with both bad cramps and Merckx’s attack, and by the time he made his way up to the front, the big boys were gone. Battaglin got help from Hennie Kuiper and Francesco Moser (riding in his first Giro), but they had to concede three minutes, seeming to put the race out of the reach of everyone not named Merckx. As the race turned north and rode through Umbria and Tuscany, the standings didn’t change significantly. At the Tuscan coastal city of Forte dei Marmi, for the first time in years, Merckx suffered a defeat in an individual time trial over 30 kilometers long. And the man who won the stage? Felice Gimondi beat the Belgian by 31 seconds. His superb ride moved him to second place, pushing Battaglin down to third at 9 minutes 34 seconds. The next day Michele Dancelli was expelled from the race for using “intemperate language” on the race jury after the stage eight fines were imposed. Two Dolomite stages were next. Stage eighteen, from Verona to Andalo went over the Bondone and the Paganella. The previous day it had rained hard on the miserable, huddled peloton and the prospect of a cold, snowy day on the Bondone scared both the riders and the organizers. But the sun came out and so did Merckx’s Moltenis. Just as most of the riders were picking up their feedbags and the Bondone started to bite, Merckx’s team gave it the gas, forcing many of the riders to forgo their musettes. The Spaniards, not expecting the attack, were already off the back before the hard work was expected to begin. With a huge effort Fuente bridged up to the leaders. Upon making contact he attacked, and this drew out a select group of riders as they climbed the steepest part of the 27-kilometer ascent: Merckx, Fuente, Gimondi, Moser, de Vlaeminck and Lazcano. The last ten kilometers of the Bondone pass were unpaved and here Lazcano galloped away, taking Fuente with him. They crested with less than a minute’s lead, and of course they were caught in a general regrouping on the descent. On the far milder Paganella, Fuente attacked again, but his efforts on the Bondone climb had left him without punch. Now it was Merckx’s time to go clear, Gimondi and Battaglin being the only riders able to keep him in sight. Merckx held on to a 46-second gap all the way into Andalo with Gimondi and Battaglin second and third. Fuente came in sixth, 3 minutes 30 seconds down. The penultimate day had four major climbs: the Valles, Santa Lucia, the Giau (the Cima Coppi) and the Tre Croci. On the Passo Valles, Fuente jumped several times before getting clear. Still alone after the Santa Lucia, he tackled the Giau while Merckx was content to go at his own speed, topping the Giau with Battaglin for company, 2 minutes 25 seconds behind Fuente. At the start of the Passo Tre Croci, Fuente’s lead was two minutes. Moser and Ritter had tried to get up to Fuente but the Spaniard was on song and increased the gap on his chasers to 2 minutes 45 seconds. There were 24 kilometers of mostly downhill to go and one might expect two superb big-gear men like Moser and Ritter would be able to reel in a small, exhausted climber. They couldn’t. Fuente pulled off one of the great rides, being away for more than 130 kilometers and finishing 1 minute 6 seconds ahead of Moser, allowing Fuente to take the Mountains Classification lead away from Merckx. Having suffocated his competition, Merckx had a commanding lead in the General Classification. The points and mountains classifications, however were still not completely settled as the Giro started the final stage into Trieste. Fuente scooted over the Passo della Mauria first and secured the mountain prize. De Vlaeminck made an attempt to win the stage and take the points prize from Merckx, but he was swamped when the Bianchi squad positioned world champion Marino Basso perfectly for the sprint. Merckx now had four Giro wins. In winning the 1973 edition he did what no man had done since Alfredo Binda in 1927, taking the lead on the first stage and keeping it until the end. Moreover, along the way to winning his “sunrise to sunset” Giro he won six stages. It was a scintillating performance.